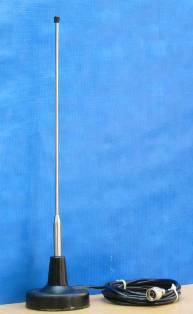 This Magnetic Mount Whip Mobile ¼ Wave, all brass antenna, uses base loading technique for smooth impedance matching. Air-cored base loading technique keeps the losses to minimum. This Magnetic Mount Whip Mobile Antenna comes with a 3.5 Meter long LMR-200 Coaxial Cable with N-Male Connector. This Magnetic Mount Whip Mobile Antenna can be fixed on any type of vehicle with metallic roof.